For this recipe we have used a rectangular pastry base for no other reason than it's boring to always use a circular base! 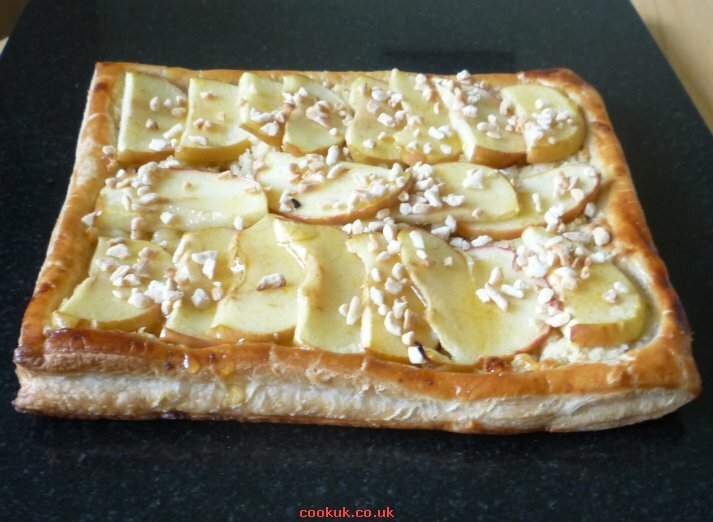 This is really an open apple tart but galette sounds impressive. 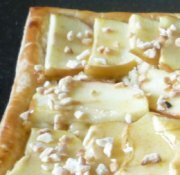 This is a delicious dish similar to and open apple tart but much lighter. The almond base compliments the apples so deliciously! The pastry size is probably too big for most ovens so we suggest that cut it in half and make two galettes. 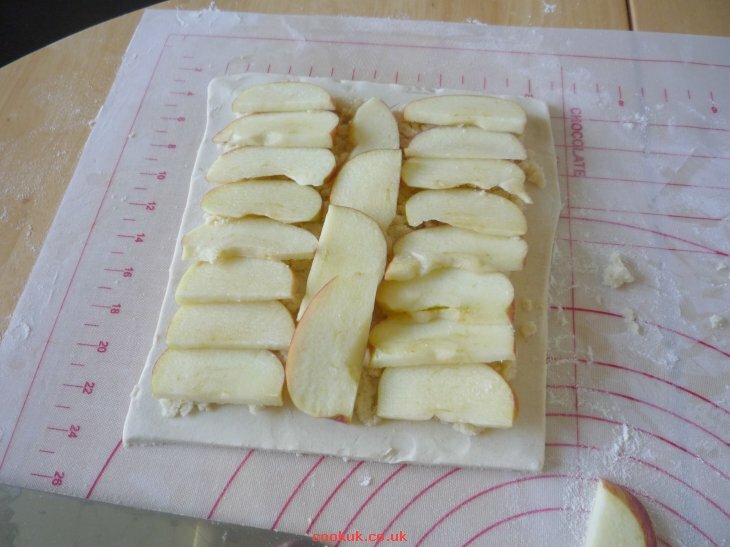 Just remember to place the pastry on baking paper before adding the filling. Peel the apples, cut them into quarters and remove the cores. You can peel them if you prefer but it's not necessary. Cut them into thinnish slices. Cut out some non-stick baking paper to the size of the baking trays. 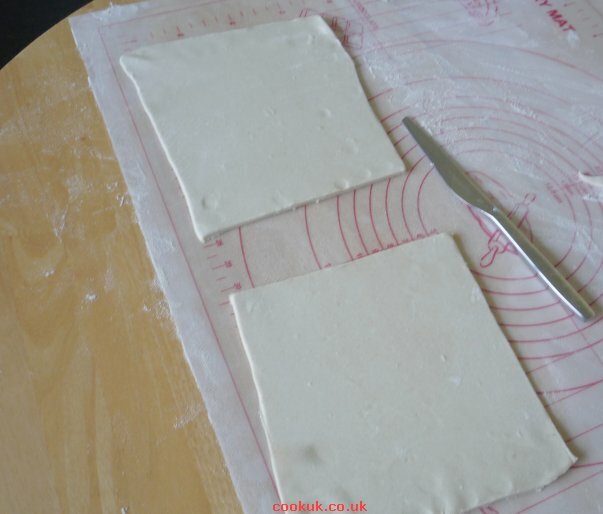 Use a rolling pin to roll out the puff pastry to approximately 40cm x 17cm / 16in x 7in). In our case, this size is too big to fit in the oven so we cut the pastry in half. When rolling out the pastry make it slightly bigger than the required size and trim up with a knife. Absolute accuracy is not essential. For sizing the pastry we used a non-stick pastry mat placed on a table. They are ideal for this purpose and can be cleaned in the dishwasher. They also have pre-drawn circles so that you can get the size exactly correct. 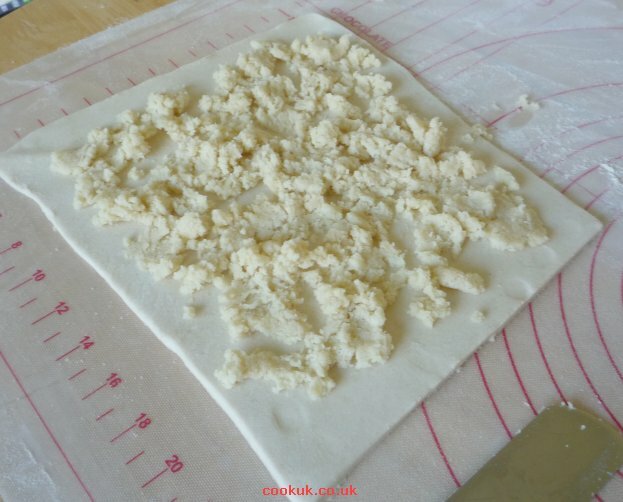 Click here if you would like to buy our top quality, silicone, non-stick pastry mat. Turn on the oven now to 200°C / 400°F / Gas mark 6 to pre-heat it in time for cooking your Apple Galette. Before doing anything else, line the two baking trays with non-stick baking paper and transfer the two puff pastry bases onto the baking trays. We forgot to do this and it was very difficult to transfer the topped pastry at a later stage! Place the ground almonds an apple juice in a bowl and mix them together with a fork. Place half the almond and apple juice mixture onto each of the pastry bases and spread it out as evenly as possible with a fork. Spread the mixture so it doesn't go completely to the edge. 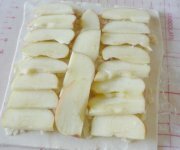 Arrange three rows of sliced apples over the almond and apple topping. Place in the pre-heated oven for about 20 minutes. It is cooked when the pastry is a lovely golden-brown colour. Warm the apricot jam and then pass it through a sieve to remove any lumps. Brush it over the top of the cooked galette and then sprinkle with the chopped nuts. Apple galette is delicious served either hot or cold and goes well with ice cream, custard or creme fraiche.